Many locals are sad to see winter go, but perhaps even more are excited to welcome the coming spring with open arms! Here at El Pueblo Lodge we love the excitement of the changing seasons in the beautiful Sangre de Cristo range and are never left wondering what to do. We encourage all of our guests to get out and enjoy the spectacular town and surrounding mountains every spring. There is so much to see and do that you will treat us simply as a place to rest your head after a long day enjoying the wonders of Northern New Mexico.Wondering specifically what to do in Taos NM? Check out these three events that mark the end of winter and the beginning of an exciting spring and summer ahead. Closing day at any ski resort is a day to celebrate the many laughs and memories of a winter past, and Taos Ski Valley may very well throw the best celebration around. April 3rd marks the last day to ski, and in addition to the standard revelry is the greatest event of the season: The Pond Skimming Championship. Watch hundreds of costumed people attempt to cross a nearly 100 foot pool of water on skis, snowboards, or creative contraptions of any kind. While the event is open for anyone to compete, simply showing up to watch the spectacle is totally worth it! The Taos Shortz Film Fest, featuring more than 150 films from over 33 countries, has become a staple of spring in the Sangre de Cristo range. The Taos Community Auditorium, less than half a mile from El Pueblo Lodge, will host this event from April 7 – April 10. The many global short films, clinics, speakers, and parties make this a must-do for anyone visiting the area in early April. 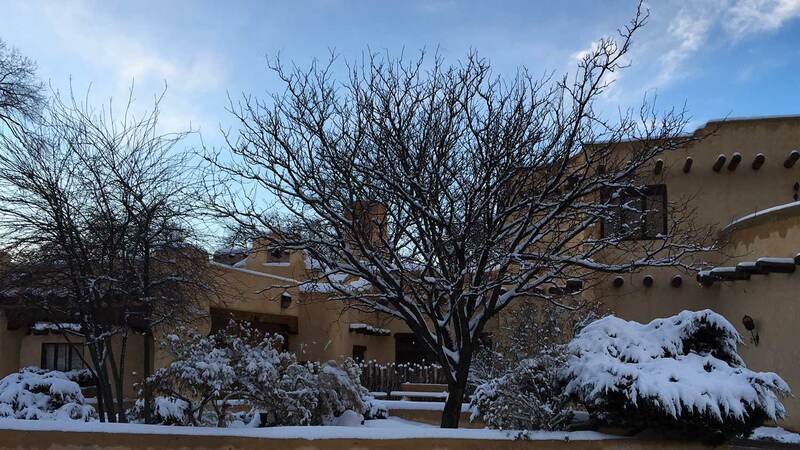 Less than a mile from El Pueblo Lodge is the Arthur Bell Auditorium at the Harwood Museum of Art, and on April 16th and 17th the Taos Chamber Music Group will be performing Colores! – a program in celebration of the coming spring. Featuring flute, clarinet, violin, cello, and piano, this quaint auditorium will come to life with the sounds of blossoming flowers, warm evenings, and longer days as the summer draws near. If you are thinking of visiting Northern New Mexico but wondering what to do in Taos, wonder no more! Spring is the perfect time to book a stay with us. And as the hiking trails start to thaw and the mountains and valleys return to life after a dormant winter, there truly is no better time to visit the Land of Enchantment.